NephMadness 2015: Why is Preeclampsia So Important to the Nephrologist? Dr. August is the Ralph A. Baer, MD Professor of Research in Medicine, and a Professor of Medicine, Public Health, and Medicine in Obstetrics and Gynecology at Weill Cornell Medical College. She is Director of the NYP-Weill Cornell Hypertension Center, and the Program Director for the Nephrology Fellowship training program. Dr August is an expert in the field of hypertension and nephrology, Dr. August is committed to the prevention and treatment of high blood pressure. Her clinical practice at Weill Cornell is largely devoted to prevention and treatment of hypertension, kidney disease, and cardiovascular disease. She has served on numerous government advisory boards providing guidelines for the treatment of hypertension and hypertension in pregnancy. She is currently an Associate Editor for JASN. 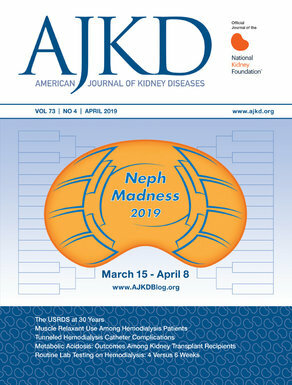 Phyllis August is the selection committee member for the Obstetric Nephrology Region of NephMadness. Her research focus is on hypertension in pregnancy and discusses why preeclampsia is important to the nephrologist below. Preeclampsia remains one of the more enigmatic syndromes afflicting humans (there is very little evidence that other species are affected). Although the obstetricians tend to think of this as a pregnancy problem; to a nephrologist, this is perhaps the most common cause of kidney disease (5-10% of all pregnancies!). The sheer magnitude of the at risk population – not just the potentially reproductively active females; but also their offspring, who, if born preterm (<37 weeks gestation), might be at risk for the sequelae of reduced nephron number. It bears reminding the nephrologist that preeclampsia is the leading cause of indicated pre-term birth. Fortunately the renal manifestations (proteinuria and mild reductions in GFR) are relatively short lived and usually not as dramatic as the hypertension – which may be severe and can lead to the unspeakable tragedy of intracerebral hemorrhage and maternal death. However, preeclampsia is the leading cause of AKI in the setting of pregnancy, and women with any form of mild or even latent CKD (e.g., atypical HUS) are at risk for the more severe renal manifestations of preeclampsia, including ESRD. Whether preeclampsia is a true risk factor for later development of ESRD, independent of other preexisting renal diseases, remains a matter of debate. What makes this disorder so vital to the nephrologist is that greater understanding the pathophysiology has the potential to open a window into new mechanisms of hypertension, proteinuric kidney disease, and CKD. The discovery of sflt-1 as a mechanistically relevant protein in the pathogenesis has been one of the more important discoveries in this field and I anticipate that it will lead us to new treatments of not only preeclampsia but other proteinuric kidney diseases as well.